Please join us for a very GeoPub Christmas! We will be celebrating the upcoming end of year and festive season in the only way we know how… Beers and free BBQ. 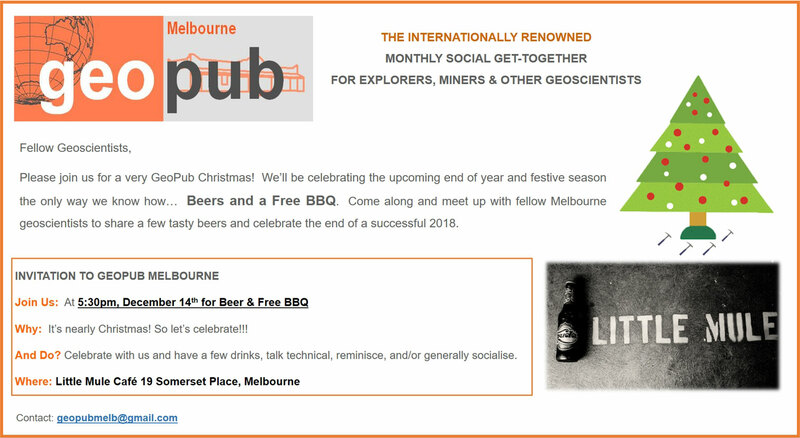 Come along and meet up with fellow Melbourne Geoscientists to share a few tasty beers and celebrate the end of a successful 2018. Join us: At 5.30pm, December 14th for Beer & Free BBQ. Why: It’s Nearly Christmas! So let’s celebrate. And Do? Celebrate with us and have a few drinks, talk technical, reminisce, and or generally socialise.